Because 2014 was the first year when the Analyst Value Survey had around 140 valid responses from Asia and Oceania, Influencer Relations’ Analyst Firm Awards for 2014 can also spotlight the leading firms in that region. Looking at the data, it’s very striking that the demand-side and supply-side use very different portfolios of analysts. More people on the demand-side responded to our survey, but they each use fewer analyst firms than do people on the supply side. That means that the supply-side in the region is getting more value from analysts than the larger demand-side. 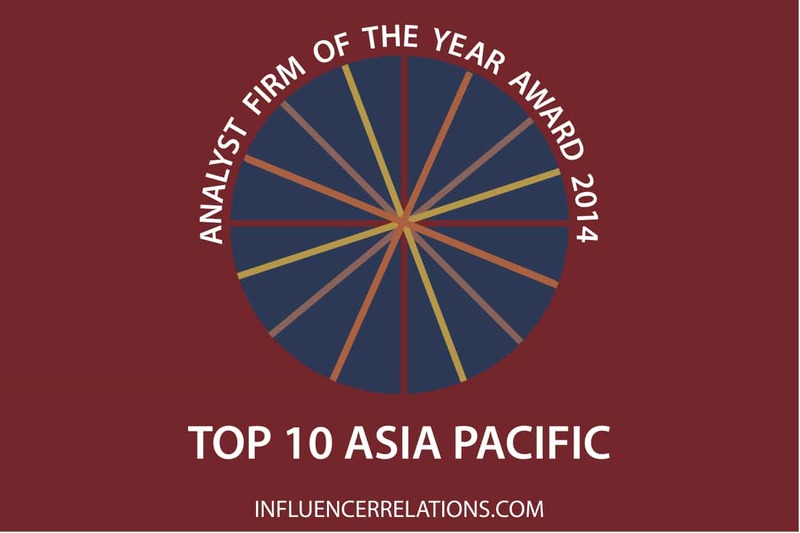 Ten firms shared the Asia Pacific Analyst Firm of the Year Awards for 2014. Gartner has a leading position with vendors in the region, especially in the services and software region. Indeed, it’s one of the few firms that have more supply-side users than demand-side users in the region. Greyhound Research is being well used by firms looking for insight into cloud applications and platforms, and into big data and analytics. Its freemium users rate its insight very highly. Like HfS, it is respected for independence. HfS Research is a very strong contender in the services space, especially outsourcing, with most of its users also benefitting from Everest Group and Gartner insight. However, a very small percentage of those using HfS insight are paying customers. NelsonHall came very close to HfS and certainly beat it on one criterion (perhaps the most important); having paid customers. HfS has more reach, but NelsonHall knows how to capture value. IDC is held back by its modest freemium and social diffusion. It’s taken seriously by the demand-side and journalists. Forrester Research is seen as being especially influential on investors and the media. It is also strong at getting paying customers, perhaps because of its consulting services and purchase of Springboard. Everest Group‘s another firm that seems to be getting business development right in Asia Pacific. It seems to be especially valued by vendors looking for business leads. ISG is also a services leader, addressing similar clients to Everest Group, with a similar focus on outsourcing and analytics business leads. It suffers from a very low profile with investors. Celent is a financial services specialist that, compared to other firms, seems to put more of an emphasis on Australia than other firms. Its clients feel it is notably influential on buyers, and they trust its insight. For many Aberdeen Group will be a big surprise in the top ten, and the only one of these ten firms to be used as widely by the demand-side as by suppliers. As a research firm producing content to enable marketing and thought leadership campaigns, it is valued by firms concerned with strategy challenges. Its unique business model and remarkable reach also means that it’s thought by some vendors, rather mistakenly, to have a notable influence on buyers while others rule it out. Generally, vendors underestimate Aberdeen’s impact. A few runners up are also worth mentioning. Frost & Sullivan and Ovum both had slightly more users in the region than Celent or Aberdeen. 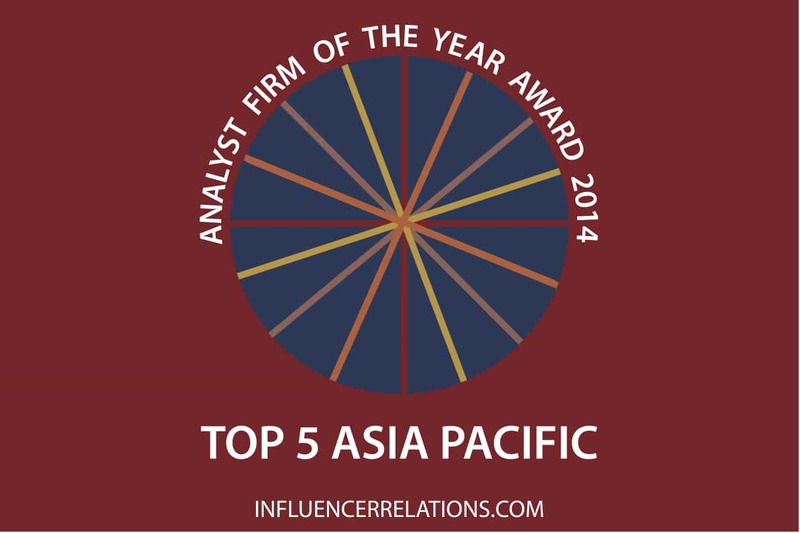 Frost & Sullivan has a much higher profile in Asia Pacific than other regions. Ovum does especially well in terms of paying customers, but their services did not rate as well. Users in the region had some concerns about their independence. Deloitte, KPMG and CapioIT are also worth mentioning. The first two are global firms that seem to be taken very seriously as providers of analyst-type support in Asia Pacific. CapioIT, on the other hand, is an Australian firm being used globally by some of the most notable firms trying to use outsourcing and other IT services to drive strategic innovation. In four years, founder Phil Hassey’s built a brand that’s credible in his native Australia, but primarily has a global audience. As a services and cloud expert Phil’s customers are mostly savvy solution providers who say that he has the independence and the insights they need on key topics like outsourcing, IT services and cloud applications. They want three things: research, direct access through inquiry calls and face to face advisory days. Of course, the last two of those three things are both expensive and logistically hard with almost all the firms I mentioned. They play to Phil’s strengths. Not every analyst can set up for themselves as successful as Phil has. He has 20 years’ research experience and a very high profile.Furthermore, few firms make their business principles as clear as CapioIT does. It would be easy to see that with two or three sales people, and then two or three consultants, CapioIT could become a firm with a global reach. This entry was posted in 1. Identify & Evaluate, 3. Engage & Influence, Asia-Pacific. Bookmark the permalink.